Him: Sorry, what was your name again? Him: Are we lost, Packy? This is a splendidly done simplistic film that explores a theme, and gives each viewer something different that they take from it. The premise is simple: an unnamed celebrity actor (Morgan Freeman) decides to research for an upcoming role by visiting a store and watching people. 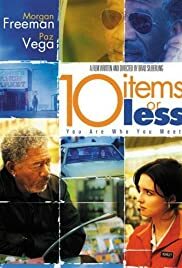 He takes particular interest in the cashier at the "10 Items or Less" lane (Paz Vega), who he finds an amiable, strong, and curious presence. Both actors play off each other brilliantly and bring solid dimension to characters in what is a character study. Not a conventional character study; they each represent entire worlds. 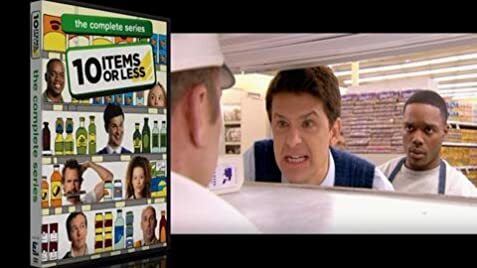 The cashier's life is mired in a harsh and frustrating "real world," while the actor is so enmeshed in his fantasy existence that he can't do simple tasks like remember phone numbers. He readily admits he's putting on a face when he talks to people, and the whole point of researching real people shows he's not one of them. But not only is the actor inspired by real people for his work; we see the reverse process as well. Several characters recognize "Him," and make reference to how he has inspired them with his movie roles. The cashier's favorite song "Al Pasar la Barca," about how a girl refuses to hide behind beauty and prefers instead to pay (ie: do honest work) for boat passage, couldn't have been chosen better. It parallels with the Vega character, the only store employee with any brains or ambition, who is willing to work hard to succeed. (That's quite an aspiration, for somebody who looks like Paz Vega.) It's an odd little film, probably made on a shoestring. If you don't mind slow pacing and a "talky" approach, this film will entertain. The characters are perfectly contrasted, and the effective acting makes them endearing. A nice watch.